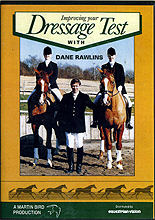 Dane Rawlins is one of the UK's foremost international dressage riders and trainers and has a considerable reputation for training both horse and rider. He is also on the Dressage Committee of the British Horse Society where he is a member of both the Dressage Tests and Training Sub-Committee and Chairman of the latter. Dane is very well qualified to help you improve your dressage test. He firmly believes that â€œdressage is a wonderful discipline and a wonderful sport.â€� In this program he shares his enthusiasm and expertise with you to help give you a greater level of enjoyment and satisfaction when riding a dressage test â€“ which can be a daunting experience for even the top professionals! With the help of informative graphics and several different horses and riders, Dane shows you that with careful preparation at home and a basic understanding of the test and its movements you can start to gain those vital extra marks. All aspects of Novice and Elementary tests are explained in detail plus hints on learning the test, riding corners and using the arena to your advantage. Dressage competitions should be more of a pleasure than an ordeal. This program will help give you the confidence to ride your dressage tests more efficiently and successfully.